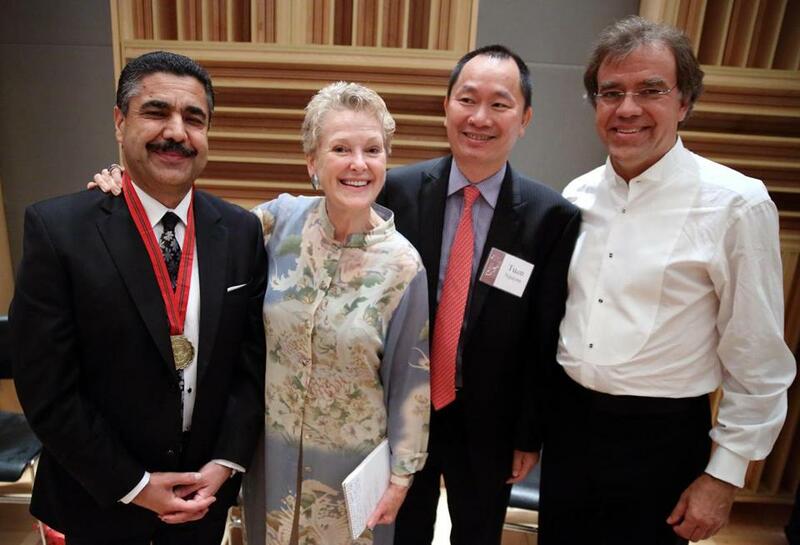 From left: Ahmad Naser Sarmast, Swanee Hunt, Tuan Nguyen, and Christopher Wilkins. Unable to perform at the Hatch Shell Wednesday due to heavy rain and the threat of lightning, the Boston Landmarks Orchestra took its act indoors, playing at WGBH’s Fraser Studio and recording the concert so fans could hear it online. (It is up at www.landmarksorchestra.org.) Directed by Christopher Wilkins, the orchestra was joined by more than 125 singers from Back Bay Chorale, directed by Scott Allen Jarrett, and One City Choir. The concert included the world premiere of “At the River” by Larry Thomas Bell, as well as Leonard Bernstein’s “On the Waterfront” and Carl Orff’s “Carmina Burana.” In addition, the annual Charles Ansbacher Music for All Award was presented to Ahmad Naser Sarmast for his work as founder of the Afghanistan National Institute of Music.